Botanical Gardens : Botanical gardens are a major tourist attraction for those who visit Ooty, one of the most popular hill stations of India. They sprawl over 50-acre and lie on the lower slopes of Doddabetta peak, which is the highest point in Ooty. Marquis of Tweeddale established these gardens in the year 1848. The gardens are formally laid out with lily ponds, and there are clipped bushes in the form of elephants, with raised trunks. One can find a thousand different species of plants including some thirty types of eucalyptus in these gardens. There is also a fossilised tree trunk, which is said to be 20 million years old. Towards the eastern part of the garden there is a wooden house made of logs known as "Toda Mund", which provides an excellent view. Ooty Lake : About 1-km distance there is an artificial lake with a charming look, which was formed in 1824 by Mr. John Sullivan, the then Collector of Coimbatore. 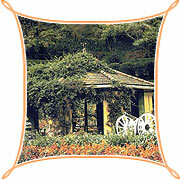 Rose Garden : Rose Garden is situated about 3 to 4-km away from Charring Cross. They are spread over an area of 10 acres of land with 2000 variety of roses. Rose Gardens lie on the way to the boathouse. St Stephens Church : Situated in the hilly area on Club Road, St Stephens Church is said to be the oldest in the Nilgiris. The church was built in 1829 and consecrated in 1830. The beam of the church was taken from the palace of Tipu Sultan at Srirangapatnam. The cemetery close by houses the grave of John Sullivan, the founder of Ooty. 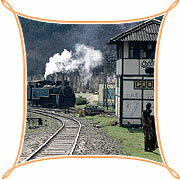 Accommodation is available at the luxurious and economy class hotels, lodges, and resorts in Ooty. Both Indian and Western style accommodation and food are available. Prior booking is advisable, especially during the summer months. Air : Coimbatore, 105 km from Ooty, is the nearest airport. Rail : Ooty is on the narrow gauge railway, connected to Mettupalayam (47 km), which is directly connected to Coimbatore and Chennai. The famous toy train connects Ooty with Mettupalayam and Coonoor. Road : A good network of roads and national highways connect Ooty with all major towns and cities. There are regular bus services to and from Coimbatore, Trichy, Bangalore, Madurai, Kanyakumari, Mysore, Palghat, Calicut, Tirupati and other important destinations in South India. Ooty is also well connected with major cities of Kerala and Karnataka.